Throughout this term, Kevin Guyan, PhD candidate at the UCL history department, has been working with the Art Museum to create events that compliment the current ‘Black Bloomsbury’ exhibition. His own research has allowed him to take themes from the exhibition in thoughtful and unusual directions for these workshops at the Museum. 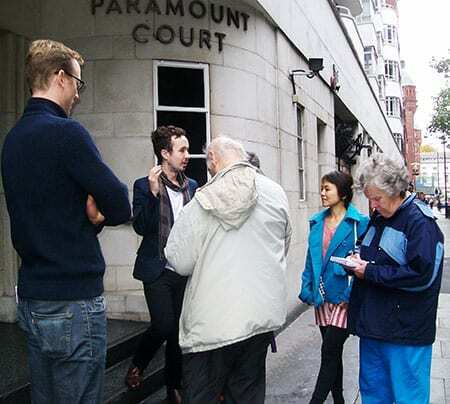 His events have included interactive investigations around 1940s music and dance, and exploring ideological boundaries within the Bloomsbury area through a walking tour. Kevin’s own research explores how domestic spaces impacted upon the production and reproduction of masculinities in the post war period (c.1945 – 1966). Although this work focuses on a different time period to ‘Black Bloomsbury’, (1945-1966 rather than 1918-1948), he has drawn upon common themes running through both eras, including space and identity, and methodologies of how historians perceive and ‘see’ into the past. For a more detailed analysis of his research and its links to the ‘Black Bloomsbury’ exhibition, please see his article ‘Engaging with Black Bloomsbury’, published on the Student Engagers website here.